Air mattresses for truck bed are made to fit on the wheel wells in your truck bed. That will enable it to provide a comfortable sleeping area, especially if you are an outdoor enthusiast. You will find them with either external or integrated air pumps which plug into the charging port of your vehicle. Some pair up with truck bed tents so that they provide a sleeping area that is sheltered whether you are camping or tailgating. They are available in different sizes in order to be able to accommodate both full and mid-size trucks. Some of them are vulnerable to deflations most of the time and that is why, when you are out looking for the best truck bed air mattresses, you will need to consider several factors. 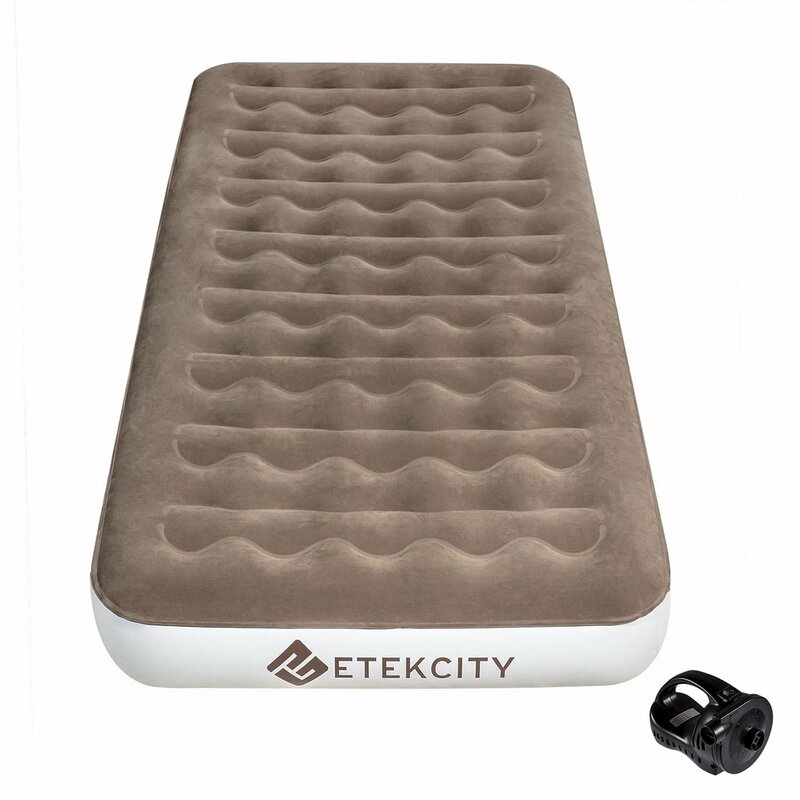 It is a quality air bed mattress that has a premium price. It is designed to fit over and around the wheel wells of your truck, creating a sleeping area which ensures that the entire truck bed is utilized. It will provide more comfort and room for you as you enjoy your outdoor activities. To inflate and deflate, you only have to plug into your 12V cigarette lighter and the mattress is good to use. You can use the pump to blow up other inflatables that you take to your camping escapades such as floats, beach toys, and towable. The top fabric is comfortable, leaving you with a soft feel and keep your linens from falling. There is a pair of wheel wells which are sold separately, which can pair with this truck bed air mattress. It has a comfortable fabric top. It provides 12 inches thick to provide supreme comfort. Wheel wells cutouts allow for stretch out of the mattress. Made up of strong PVC materials. It might be one of the best camping air mattresses that you can invest your money in. it comes with a built-in pump making both deflation and inflation simple. You will need to avoid the pump staying on for more than 15 minutes as it will overheat and then stop working. If that happens, you will need to cool it down for about 10 minutes. When it is not in use, you will have to ensure that the electrical cord is housed conveniently in the small storage area. It is a product made of PVC and thus, you need to remember that, it naturally expands and stretch. That is the reason why it can air up to varying firmness. After a few hours of inflated or sleeping on, you will experience firmness to softness initially as the PVC naturally expands. This makes some people confuse it with a leak. This particular mattress provides an option for manual deflation and inflation. This will allow you to take your mattress wherever and use it even when you are not near an electric outlet. This makes it a great option for camping. You will have to set it up on a flat surface as it is not designed to be used on outdoor terrains where there are sticks and rocks. An extra thick surface which makes it durable. It could be a perfect complement to your truck tent. It will enable you to sleep up of the ground, in a dry place, and in total comfort. It can be great if you are with a truck for adventures, weekend warriors, hunters, family campers, and fishermen. It is made of heavy duty PVC material with a flocked top that makes it comfortable to sleep on while you are out camping. 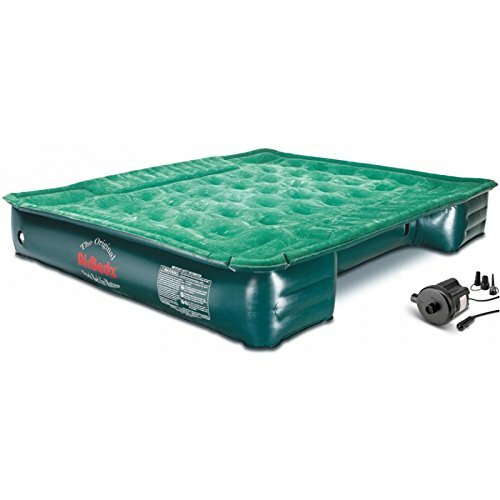 It comes with a 12V air pump which easily inflates valve to let you deflate or inflate the mattress in seconds. When the air pump is removed, the valve closes immediately to prevent any air from escaping. If for some reason the air pump is unavailable, you can use the mouth pump. You can store gear between the bed walls and the mattress due to the wheel well design. You can place your glasses, clothes, phone, duffle bag, flashlight in this area. When it comes to storage, this air mattress folds up into a stuff sack to make it an easy affair to store. It is a simple design. Comes with a patch kit, pump, and storage bag. It adds comfort to your truck bed. It is structured to resist puncture as it is constructed using heavy duty PVC that has a coil system to offer great weight distribution. It is a durable mattress which is designed to fit over and around the wheel wells so that the entire truck bed is utilized for a sleeping experience that is comfortable. The portable air pump comes with a 16-foot charger for easy and quick fill. It can fit both 6 and 8-inch truck bed layout. It can fit both short and long truck beds. The two sizes can fit mid, compact, and full sized truck beds in both long and short bed layouts. Each side has cutouts to allow the mattress to fit over and around the wheel wells in your truck, thereby creating a sleeping area which utilizes the entire bed. It offers a fast and comfortable solution to truck bed camping. It might be the perfect choice for outdoor events and trips as it offers quality and convenience for a good night’s sleep. Sleep area ensures that it has utilized the entire truck bed. It is a short truck bed air mattress that might just be the missing link between your comfortability when you are camping. The last time I went camping, I used it and it was such a great experience. It has cutouts on each side enabling it to fit over and around the wheel wells. It has an integrated air coil system which evenly distributes your weight over the 12-inch thick mattress thereby offering extra comfort. The clothes construction is made of heavy-duty material and RF welded seams which ensure that the mattress is sturdy with more puncture resistance. It comes equipped with a carry bag for easy storage and a build in the pump with a battery that is rechargeable. It also has a deflate and inflate feature and patch kit care instructions. When you want to maintain its cleanliness, you will just have to use a damp cloth. It utilizes the entire truck bed. The integrated air coil system makes it possible for your weight to be evenly distributed over the 12-inch thick mattress. It comes with an A/C home charger. It doesn’t hold air firm overnight. It comes in three parts which can be blown up separately and you can easily adjust the volume of the inflation as needed. You will find it easy to carry and at the same time easy to inflate and deflate. 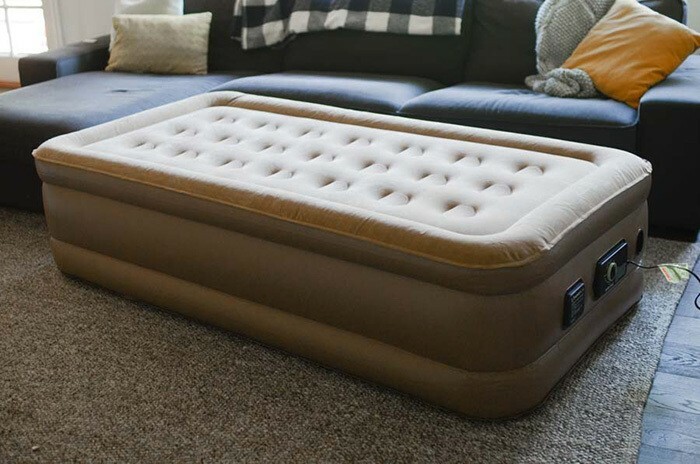 Within two minutes, you can easily inflate and deflate this particular mattress. It is heavy duty and has a streamlined design of three-piece folding and has a special design on the tire position. It is constructed of breathable compounds and eco-friendly PVC material that is not toxic, has less smell, and it is safe. The material is environmentally friendly and comes with a double-sided flocking. For a comfortable use, you will have to inflate it after 10 hours. During the inflation process, ensure that the nozzle is tightened. When in use, the recommended temperature in the truck is 13 to 140H. You have to keep inflating after every 10 hours. Queen which is 60 x 80 inches. 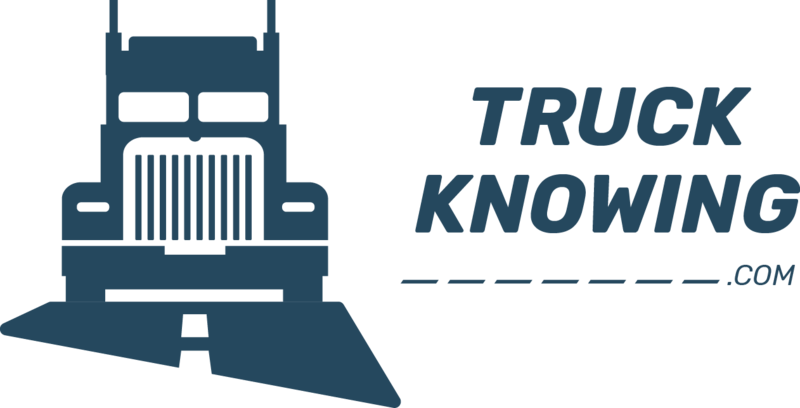 For a fuller and full XL, they have a width which is compatible with most of the truck bed, and thus, you will need to consider it. Long bed models of pickup trucks will do well if you went for the full XL as it packs an extra 6 inches in length. For the queen size, it is longer and wider, and thus, best suited for pickups that are big with extra space out at the back. You will notice differences with the dims of the mattresses as you shop around with some having extra inches, but in general, they will fit into one of the above three categories. If none of the sizes fit your truck bed, you will have to look for a custom sized mattress design and this will only happen if your truck bed is custom made. As long as you take the accurate measurements of the truck bed, then there will always be a mattress for your bed. While the PVC might be extremely tough, it might not be the most comfortable material to sleep on especially in climates that are hot. A mattress that has a top cover made of brushed fabrics can be more comfortable. To make it more comfortable when you are out camping, you can carry sheets or whatever covering to ensure that, you enhance the comfortability. For occasional or emergency use where you don’t have sheets, having a mattress with a brushed fabric can be the best thing for you. PVC is extremely tough. When it comes to a mattress which is going to be used on a truck bed, then you need to go for a material that is tough. Remember that, truck beds are not always the tidiest and cleanest places in the world. There are little bits debris and dirt and even rubbish that will always accumulate in a mattress which has been constructed from a weaker material other than PVC. The hardest part of assembling a mattress is blowing up unless your pump is good quality. Pumps are usually external but at times they are built in so that it is easy to store them. It should be able to enable you to pump your mattress very fast, in a matter of minutes. Air coils are found on high-end truck bed air mattresses and premium models. The coils are built into the mattress internal structure which is flooded with air when you inflate the bed. They will be able to help in distributing your body weight more evenly, allowing you to have a comfortable sleep. Its downside is that it makes the mattress to be damn expensive. The truck wheel wells break up and stick out what could have otherwise been a flat surface for sleeping. Best designs get around this by incorporating cutouts which you can slot in the wheel wells. When you do that, it gives you more sleeping space. If you want to use the mattress off the truck as a spare mattress in the truck, you can use a spring for filler pieces to enable you to plug the cut out the gaps. Price is an important consideration, especially if you are operating under a tight budget. Most of the truck bed air mattresses can be bought at around $150 and below. You can even find cheaper prices on Amazon.com. Ensure that, the mattress had not been used before you purchase it. Most of the truck bed air mattresses has a limited durability. But if you reserve it for occasional use and ensure that you store it properly, you can extend its lifespan. Most truck bed air mattresses come with a less than one year warranty while others don’t have any warranty at all. Get one that has at least some sort of warranty. 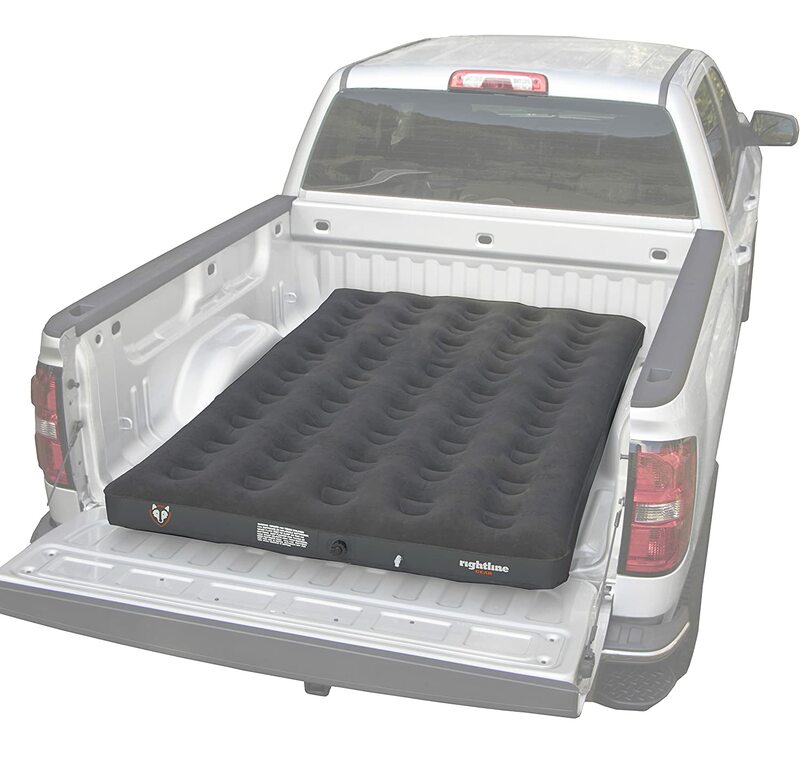 Most of the truck bed air mattress does support up to 300 pounds, which is enough for most sleepers. You will need to inquire about the weight capacity of your model before you purchase it. When you take the measurement, you need to remember that, there are three types of measurements that are important. Ensure that you take the length of the bed from behind at the point where the tail drops. It should include the tailgate if you want to get a longer mattress. Take the width which should be from one sidewall to the next. Take the width which should be between the two wheel wells. You should pay more attention to the width which should be between the two wheel wells because it is the reason why you cannot fit your truck bed with a normal air mattress if you want to maximize on your available room. It is only a truck bed mattress which will include cut-outs which accommodate the wheel wells. It is cheaper sleeping in your truck than going to pay for a motel when you are out adventuring. It comes in handy, and you will never regret why you had to spend a few dollars to purchase one for yourself. When you are traveling, you can place it in the trunk or keep it tucked under a cabin seat in case of emergencies. It is very necessary when you are going for long travels where you will need to rest along the way. If you enjoy outdoor pursuits such as mountain biking, hunting, motor cross or hiking, then you might just like to have an air mattress because a few times, you might just end up sleeping outside while adventuring. Having a mattress on your truck bed could be far more comfortable than pitching one on the floor. Remember the truck is raised up and thus, it is going to offer you with some protection from the wild animals around. You will need to store the air mattress in spaces which are not too cold or hot. You will need to ensure that the storage space should not be susceptible to moisture buildup or too humid. You need to check up the area for any sharp objects that could potentially cause punctures. The mattress has to be placed in a position where claw pets will not come into contact with it. Most of the air mattresses come with carrying cases, duffle bags, and other units for storage. These provide a layer that will offer extra protection as well as make the mattress more portable and compact. Each time, the air mattress will require inflation before you use it. Although they are designed for a customizable deflation/inflation settings, you should never over-inflate it as it can lead to rips and tears that cause air leakage. It is recommended that the inflation and deflation are done once before using to help break in the mattress. In case of a leak, you can use a patching kit or a vinyl leak repair. Most of them are sold with the mattresses themselves. You can also readily find them in sporting and outdoor goods stores. 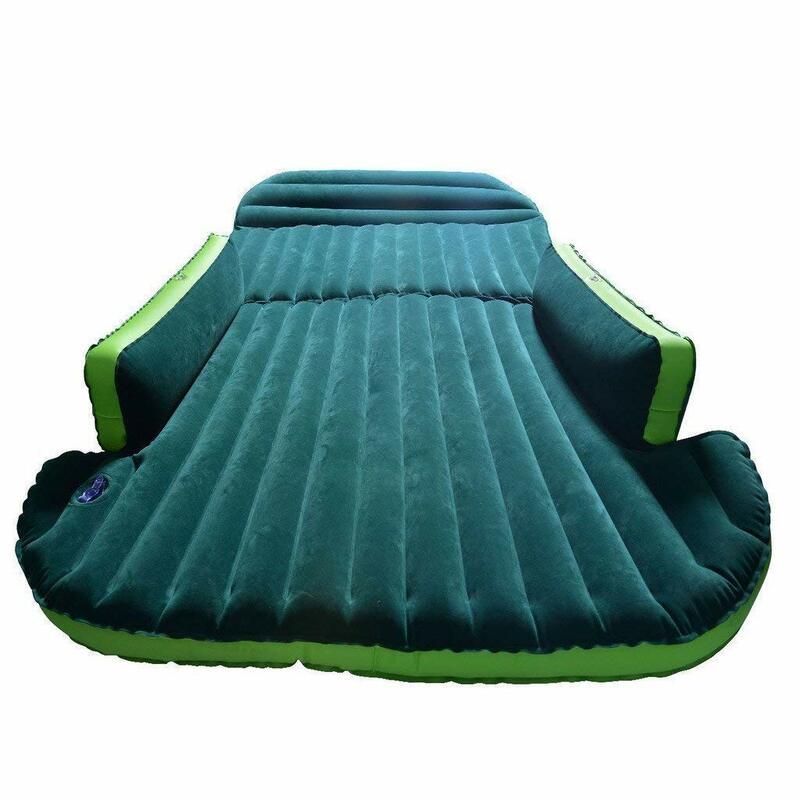 When you want to purchase an air mattress, you should not do a spontaneous endeavor, but you will need to invest in serious thoughts. There are a variety of truck bed air mattress and many more brands, and the only way to determine the best truck bed air mattress is to do your own research and make some comparisons. You can start with the 6 which I have reviewed. 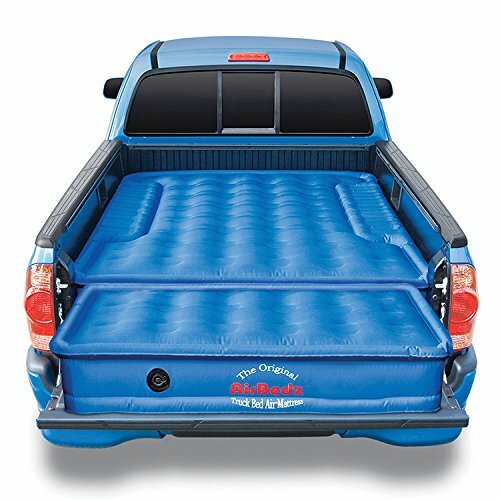 If you are constantly traveling an air mattress for your truck bed can be the best investment you can make. You need to ensure that, it is one that fits well and is comfortable to spend a night on.